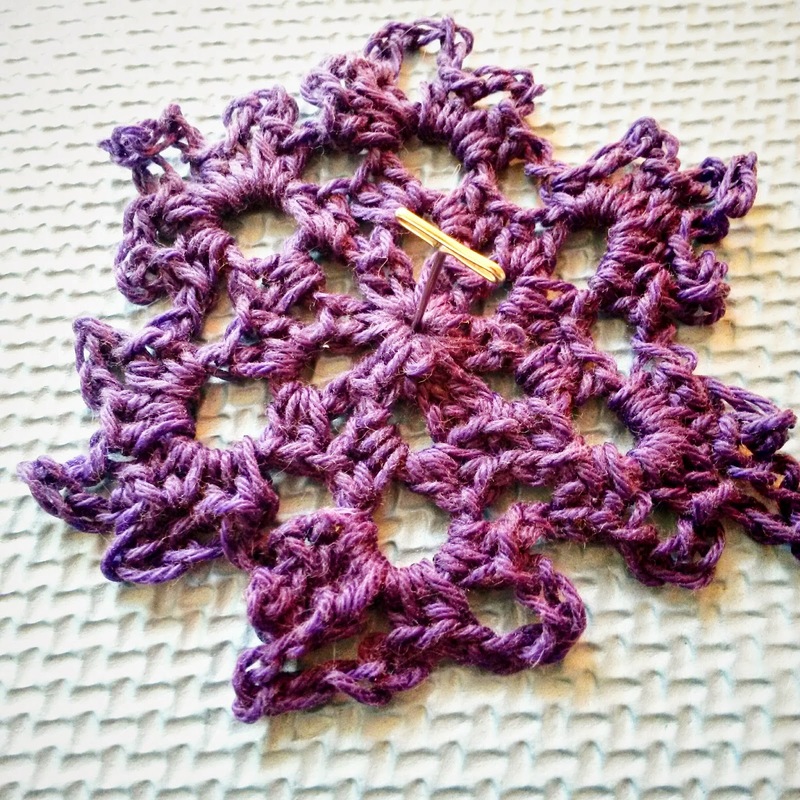 1: Crochet and finish the motif in total. This includes cutting the yarn and weaving in the ends. 2. 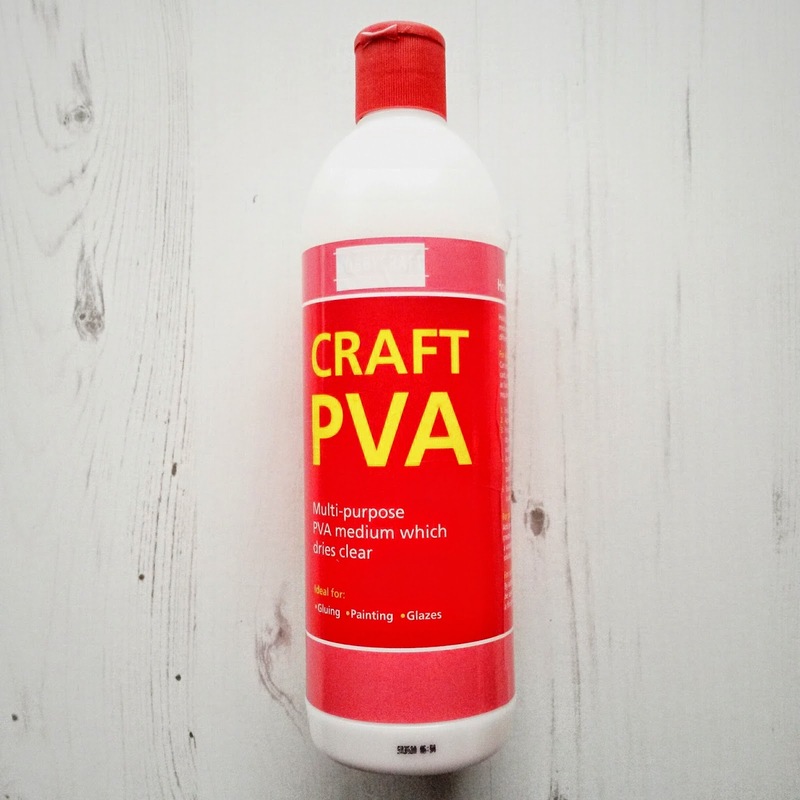 Get your craft PVA white glue ready. I use this because it dries clear. 3. 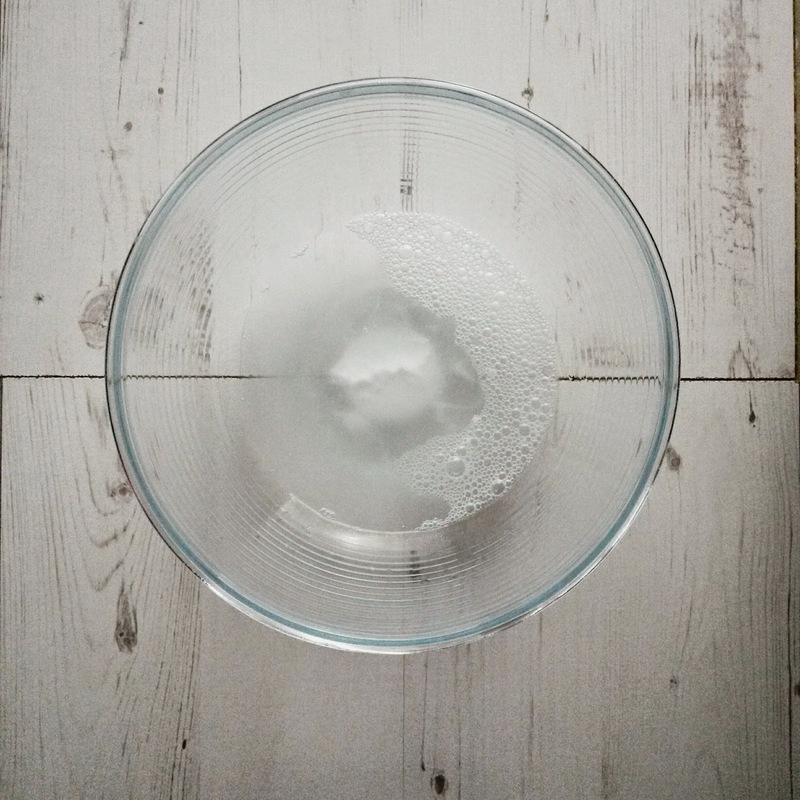 Put some of the glue in a container and add some water to dilute. The proportion of water to glue is an arbitrary ratio, but you want to add enough glue to stiffen the motif, but not so much that when the item dries it looks plastic. This is a very experimental process and most times you get it right, and then sometimes you don't (see no. 12 for alternatives). Mix the glue into the water very well. 4. 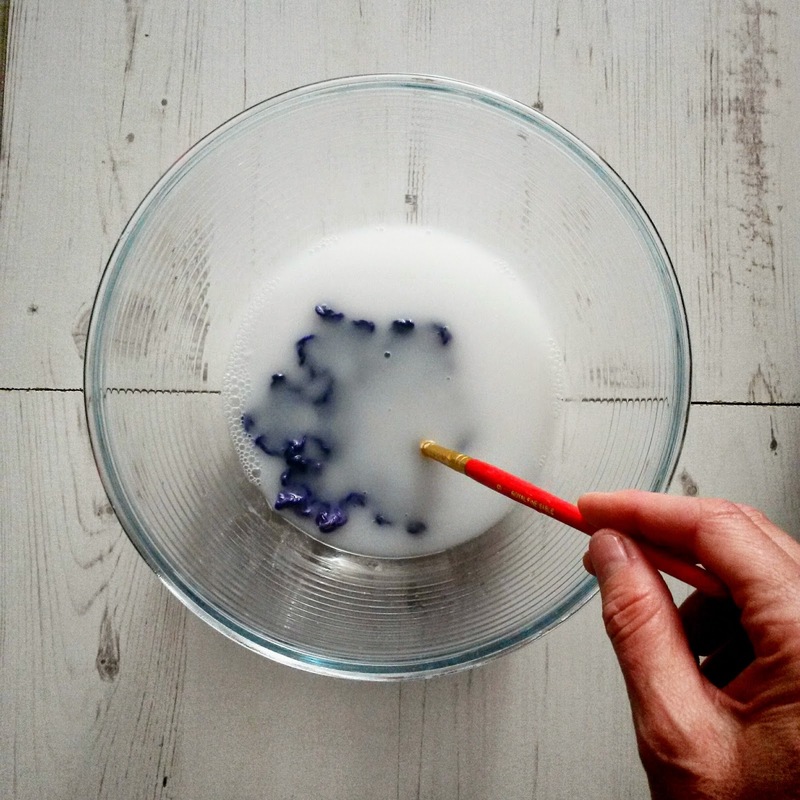 Dip the motif into the water and soak it thoroughly. This is important, as the entire motif needs to be saturated with the solution. 5. Take the motif out of the water and squeeze the excess water out of the motif. Put the solution to one side to reuse for other motifs. 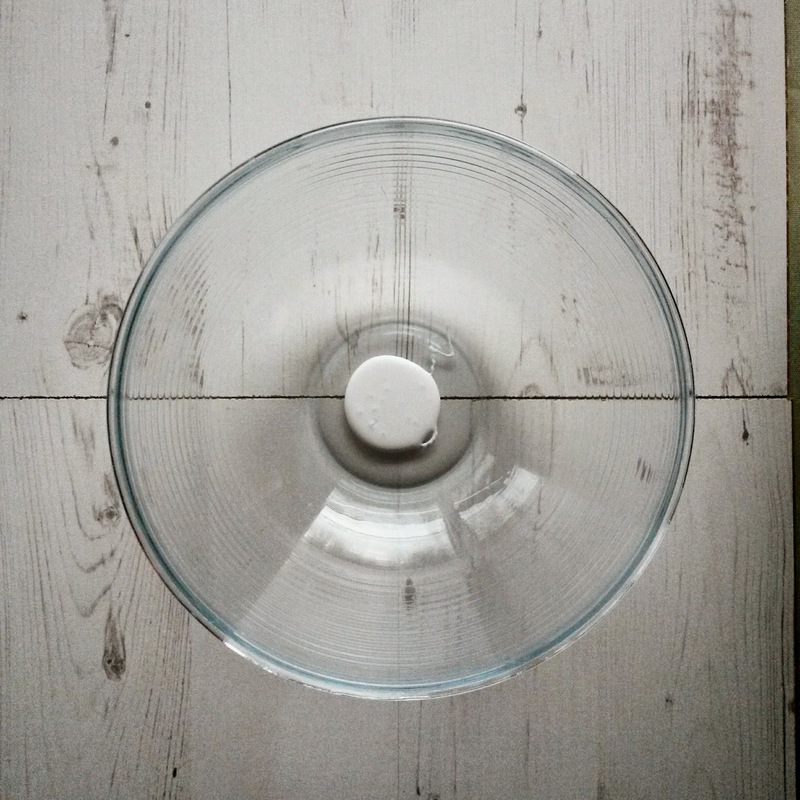 I use a plastic container with a lid that I continually come back to. 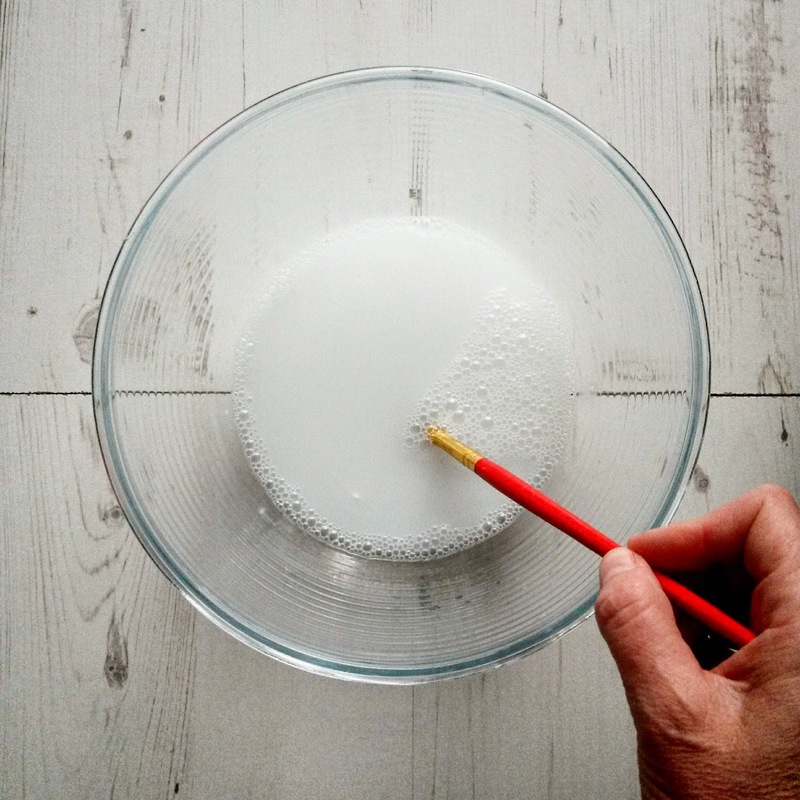 Be aware though that you cannot keep watered down glue (even in an airtight container) for too long as it goes mouldy. To mitigate this somewhat, give it a stir everyday. 6. Take your wet motif over to where you will be blocking and pinning it. This could be on your ironing board, a towel, a mattress, a cork board, or a foam mat. 7. 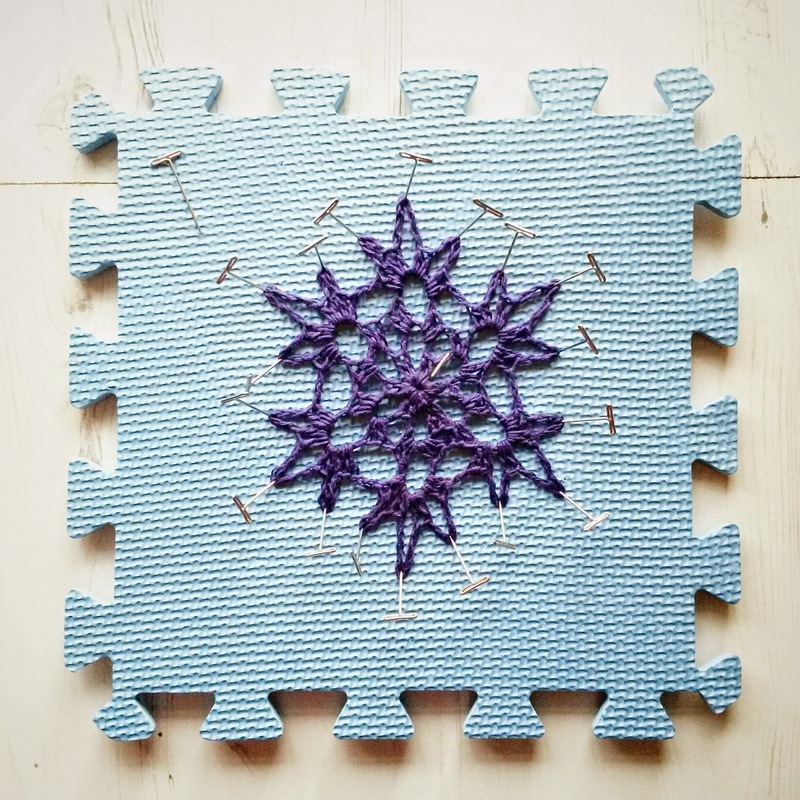 Place your motif in the middle of the blocking mat with the front side of the motif facing you, and pin it down in the centre of the motif to anchor it. 8. Gently ease out the edges of the motif and pin into place. This is a snowflake, so there are six points to pin out. 9. 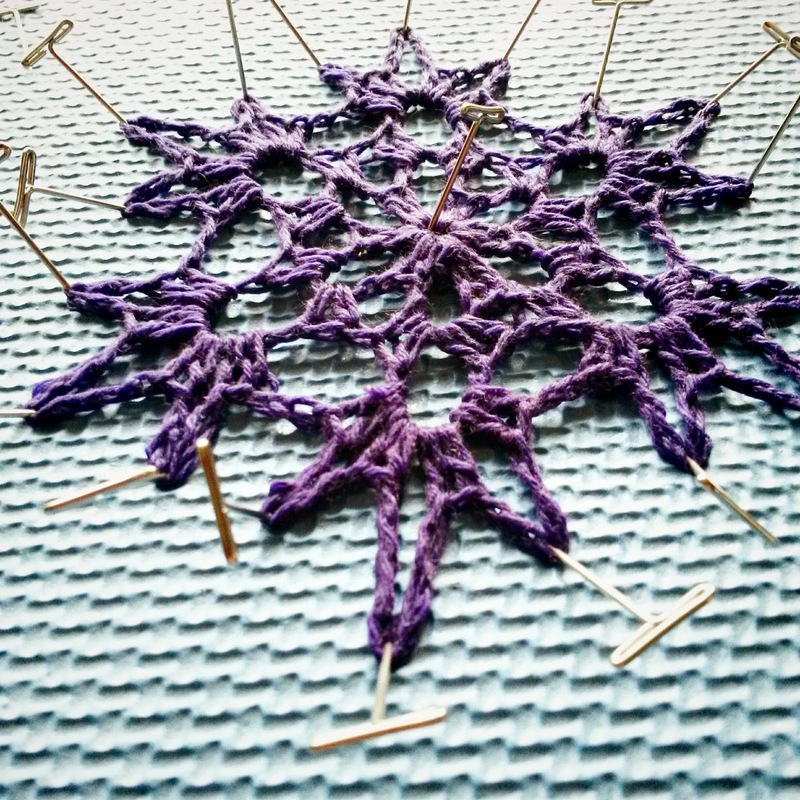 There are extra points to pin out at the edges of each snowflake point, and I've chosen to pin these out too. 10. 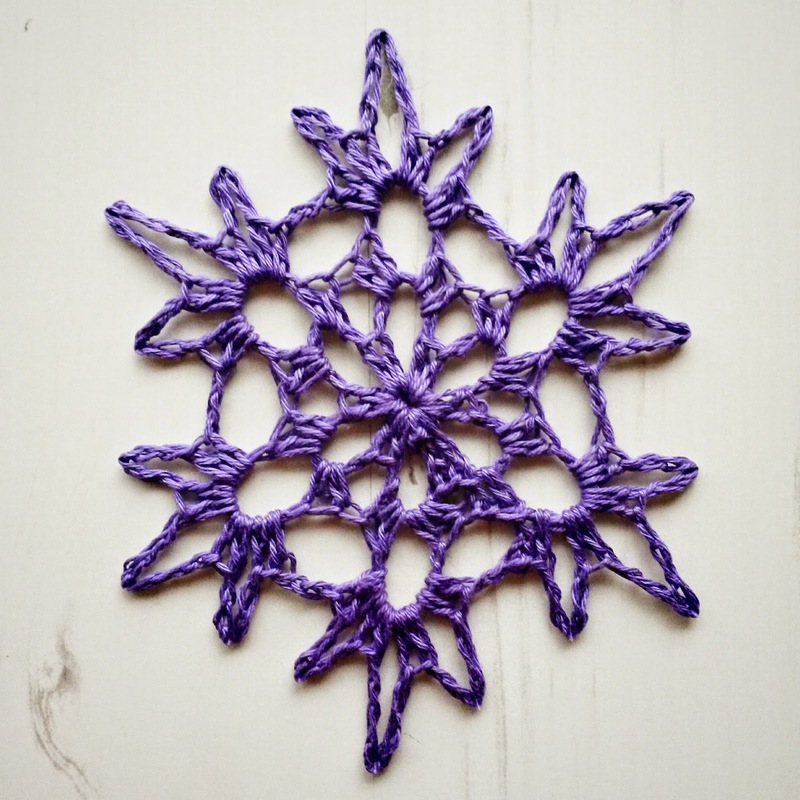 Allow your motif to dry overnight. I usually place these foam mats on top of a radiator where they will dry adequately by the morning. 11. 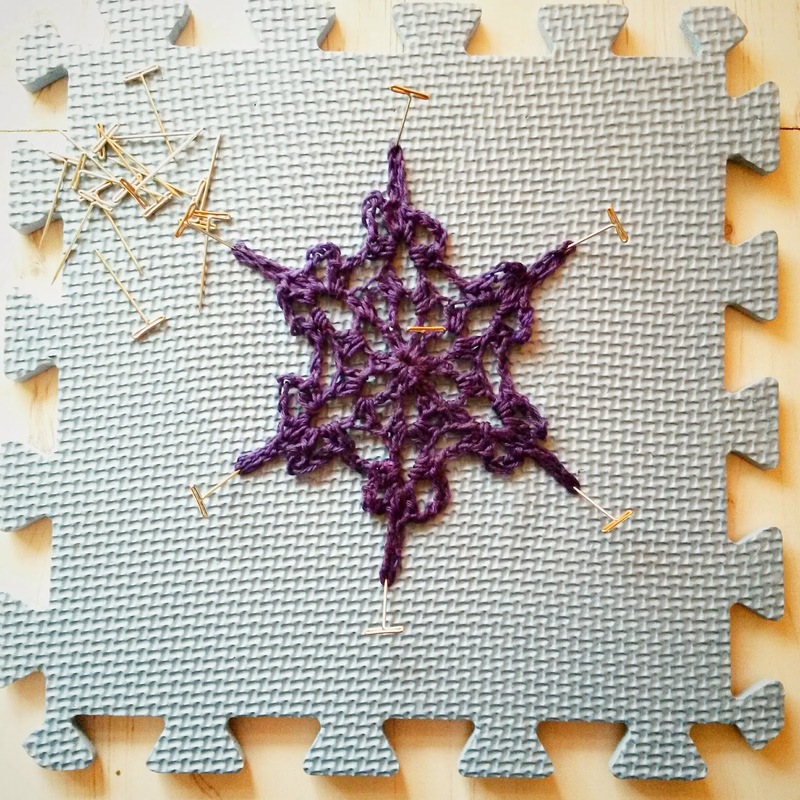 When the motif is dry, remove the pins and lift gently it from the foam mat. Use and/or decorate the motif as needed. 12. Other Kinds of Blocking - If you have an item that requires blocking, but not stiffening, there are alternatives to using PVA glue. You can block and use a water spritzer to lightly dampen the item. As it dries, it will remain in the shape that you require. This is a suitable option for garments and items of clothing to be worn (shawls, scarves, etc), and also for blankets, where you want the item shaped but not stiff. 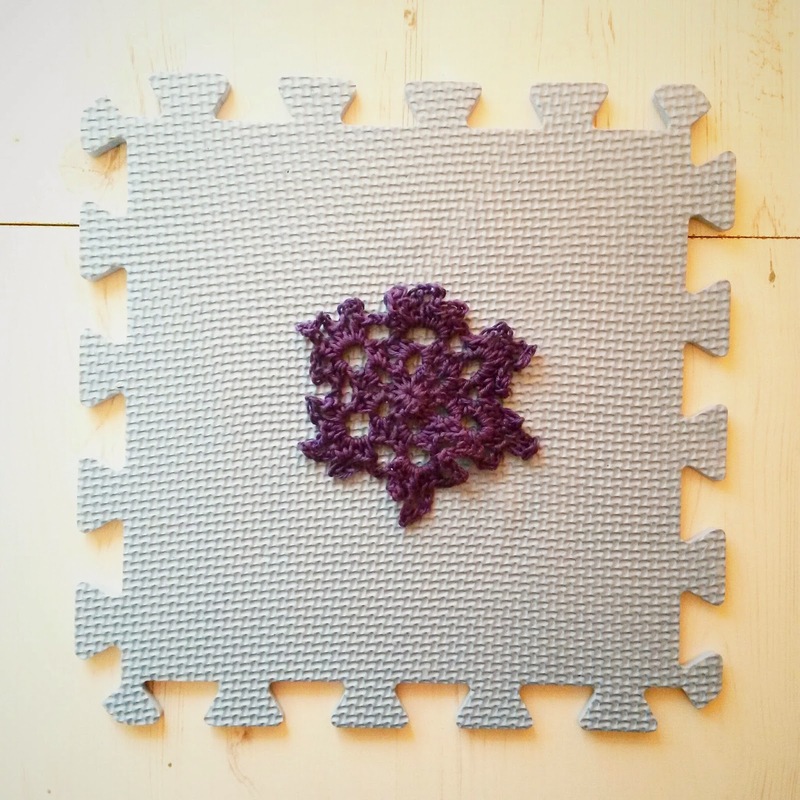 Blankets made from granny squares can be blocked before or after joining the granny squares together. 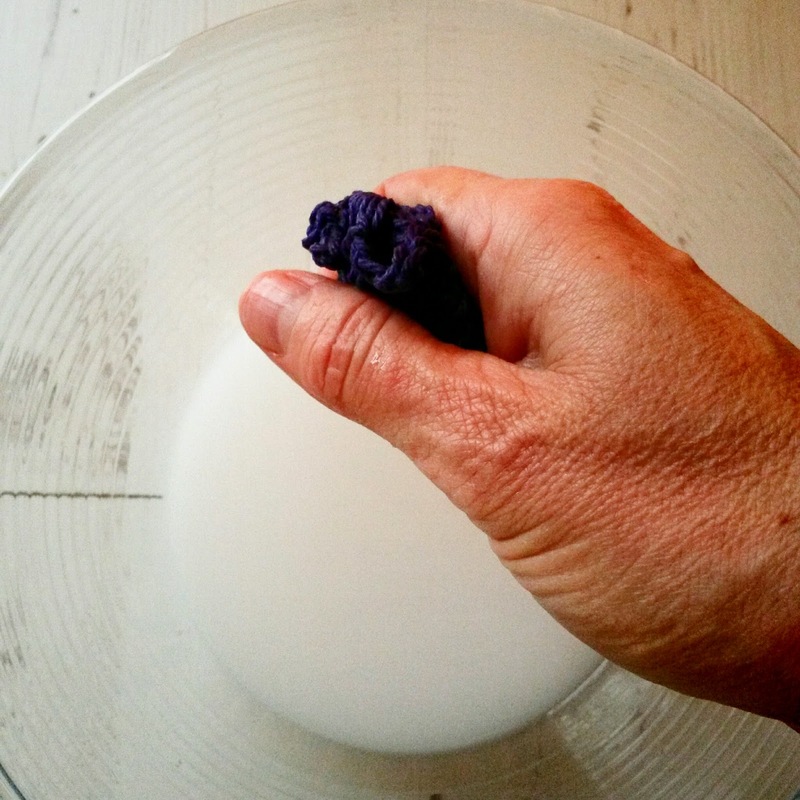 Another alternative to using PVA glue is to use a spray starch (in an aerosol can). This stiffens the item marginally. However, with use or handling the motif will soften up again and lose its crispness, although it will still remain in the shape that you blocked it. This is especially true for festive decorations that will be used year after year. Be aware that spray starch does leave the item a little sticky. This is because you usually have to iron starched items, and this eliminates this stickiness. It's not recommended that you iron a motif to simulate blocking. 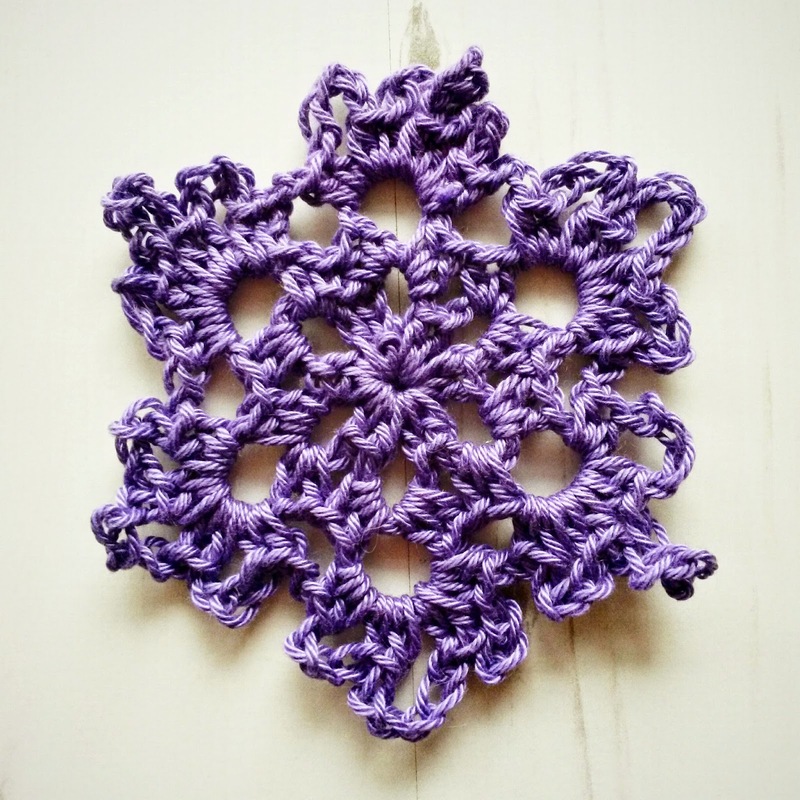 You will flatten the lovely texture that crochet gives the item. I have found, however, that using a steam iron held slightly above the blocked item allows the item to dry and block a little quicker. 13. Yarns for Blocking - There are certain yarns that block better than other yarns. I have found that cotton yarns are suitable for this because cotton is a natural fibre that can be manipulated more than a manufactured fibre like acrylic. The other natural fibres like wool, bamboo, alpaca and linen will give varying results depending on their fibre composition. Acrylic and acrylic-blend yarns have a natural bounce to them and motifs made from these fibres tend to curl a lot. These will definitely benefit from blocking. I have found that I tend to fight with these yarns a little more to get them to comply. But I have had varying results with acrylic which depends on the proportion of acrylic in the yarn. I have found the mohair yarns do not respond well to being wet or starched, but you are able to block them, and the metallic yarns (for festive decorations) block well.